August Maulsby doesn’t use public restrooms, but it has nothing to do with cleanliness. “As a transgendered person, I don’t use public restrooms because it is embarrassing and uncomfortable, and sometimes even unsafe,” he said. A new project to bring gender-neutral bathrooms to campus would change all that for Maulsby. The project, spearheaded by El Raven, SCC’s Officer of Governmental Affairs, is known as the “All-Gender Bathroom Project,” and aims to convert certain gender-specific bathrooms at SCC into gender-neutral bathrooms. Currently, the bottom floor bathrooms in the PUB are a major candidate, but the location won’t be finalized until Raven has finished with the proposal. Being transgender himself, Raven feels there is a need at SCC for gender-neutral bathrooms that can be used by people of any gender. “I have faced harassment in bathrooms,” Raven said. “Other students have confided in me stories of a similar nature, where they have faced harassment in traditional gender-segregated bathrooms.” Raven said he has been yelled at and laughed at in bathrooms, and told he doesn’t belong in them or to get out. He has never been physically harassed in one, but knows people who have. Gender-neutral bathrooms are the compromise here, creating a space where transgender people can feel safe without having to use traditionally gender-segregated bathrooms. But transgender students aren’t the only ones who would benefit from having gender neutral bathrooms, said Raven. Raven brought up the issue of parents with kids who aren’t the same gender as them, as well as disabled students with different-gender attendants, both of which are plentiful on campus. But Raven also feels that these bathrooms could have a greater overall benefit. The timeline for the all-gender bathroom project is currently undefined, but Raven has said that the earliest students would see these bathrooms available is fall quarter of 2016. Before that, however, there are still a few hurdles to overcome. On April 5, the Associated Student Government (ASG) will show a presentation to the Shoreline College Council, a committee made up of those in administration who have a hand in this issue. They are also currently gathering signatures of support from any campus organizations, to make it harder for the administration to say no to the project. 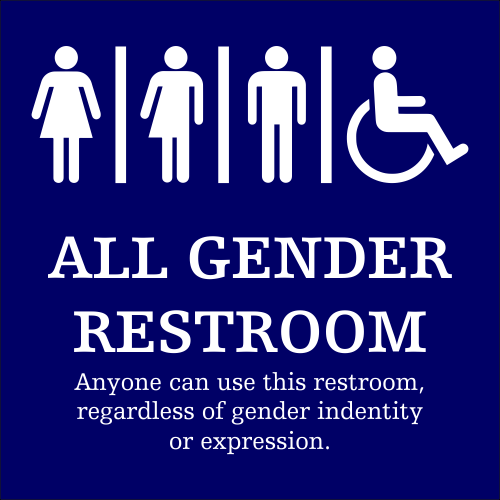 The ASG is planning to host an “All-Gender Bathroom Forum” sometime in Mid-march, held in the Quiet Dining Room. The forum will be open to all students, with the intent of educating students about the project and the issues at hand. Sometime after that, a survey will be released online to gauge students’ feelings and opinions on the idea of gender-neutral bathrooms. Raven is visiting other campuses that have implemented gender-neutral bathrooms, and is researching how those have worked out and what problems have arisen. Such problems include not having enough bathrooms, or having them in a place which is inconvenient for students to use. Raven has stated that he has not heard of anyone being made uncomfortable in these bathrooms. Raven would like to see the existing bathrooms simply re-labeled to be gender-neutral, as he feels the multiple-stall access would make more sense and would likely be more cost-effective. He feels it doesn’t make sense to box in students who require the use of gender-neutral bathrooms into single-stall bathrooms, while other students use multi-stall bathrooms. He has acknowledged the possibility of people defaulting to using “mens” and “womens” rooms regardless of signage, but feels it’s ultimately important that people are comfortable using the bathroom of their choice and knowing that they have the option of using whichever bathroom they want. One common argument against allowing transgender people to use bathrooms of the gender they identify with is that it could lead to assault by people claiming to be transgender. Such was the case in a television ad broadcast in Houston, which claimed that under the Houston Equal Rights Ordinance, “Any man at any time could enter a women’s bathroom simply by claiming to be a woman that day.” There haven’t been any reports of such a thing happening, but numerous studies have proven that transgender people are often at risk of being harassed in traditionally gender-segregated bathrooms. One such study, released in 2013 by the Williams institute, showed that of the 93 transgender people surveyed, 68 percent of Female-to-male and 59 percent of Male-to-female respondents said they had experienced verbal harassment in gender-segregated bathrooms. Meanwhile, 5 percent of Female-to-male and 14 percent of male-to-female respondents said they had been physically assaulted in public bathrooms. El Raven realized he was transgender around puberty, but didn’t officially come out until his sophomore year of high school. “For me, it wasn’t anything fantastical” he said, “I’m lucky to have a very accepting mom, at least. The rest of my family, not so much.” He said he was 13 or 14 and attending therapy at the time, and his therapist agreed that what he was feeling was some sort of gender identity disorientation issue. He has stated that he does not feel being transgender has affected how he views his role in the Student Body Government but that his experiences of being transgender have helped him keep an open eye towards diverse groups on campus. Raven thinks about how he can serve them better in his job and feels being part of a minority group has allowed him to better appreciate the challenges they face, even things which he feels he is unable to identify with directly. Raven would like to see more of a transgender community at SCC, as he feels there is a disconnect between transgender students. He wishes to see more of a support network for transgender students at Shoreline Community College. However, he won’t be taking on that project. "That's not something I've planned for, particularly,” he said. “It's a really difficult issue, it's sort of a bigger than me issue, and I would be interested to hear what other transgender students have to say about it"
He would like to see more openness on the subject, such as organizing events to talk about it. No events are currently planned, although Raven has mentioned bringing it up with ASG Social Justice Officer Emily Stensland. Outside of the bathrooms and raising awareness, Raven feels it would be helpful if instructors and faculty would ask students their preferred gender and pronouns, instead of making assumptions.